Illinois Industrial Tools - IIT 41200 4 Pack Compact Pop-Up Lanterns use high efficiency LED lighting to transforms night into day. Providing about 12 hours of luminosity from 3 AA batteries, this light weight hand sized lantern easily fits into back packs, hand bags, and glove boxes. The magnetic base allows the light to be mounted under the car hood or to side of the car for those unexpected road side emergencies. The extendable hook in the base allows provides additional options and flexibility for mounting the lantern in locations such as closets. The sleek design and compact size allows for discreet placement of lanterns through out the house for instant access in emergencies. The high impact no rust case and high grade LEDs will provide years of reliable use. Multi-purpose essential light 4 pack: Indoor/Outdoor use. 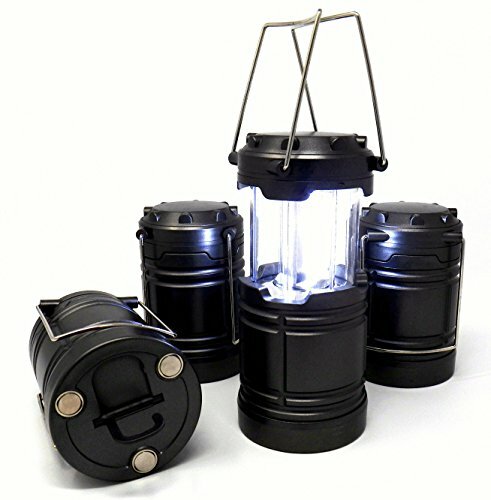 350 Lumens bright Hurricane Lantern perfect for emergency power outages, bug bags, home & auto repairs, emergency road side use, camping and more. Hand held compact size, light weight no rust high impact case fits easily in back packs and small carry bags. Magnetic base clings lantern to metal objects allowing for mounting in any direction. If you have any questions about this product by Illinois Industrial Tools, contact us by completing and submitting the form below. If you are looking for a specif part number, please include it with your message.